Chants of "I BELIEVE IN STEPHEN VOGT!" will be heard again at Miller Park in 2017. The Milwaukee Brewers and Stephen Vogt avoided arbitration Friday, agreeing on a one-year deal worth a reported $3.065 million. Vogt, one of eight Brewers who are arbitration eligible, told reporters his contract is not guaranteed. Friday is the deadline for teams to non-tender players and Vogt was one some pundits felt might be let go by Milwaukee. Instead, he’ll join Manny Pina and Jett Bandy this spring vying for playing time. Vogt made $2.965 million last year in his time split between Milwaukee and the Oakland Athletics. The 33-year-old was released by Oakland in June and picked up three days later by the Brewers. 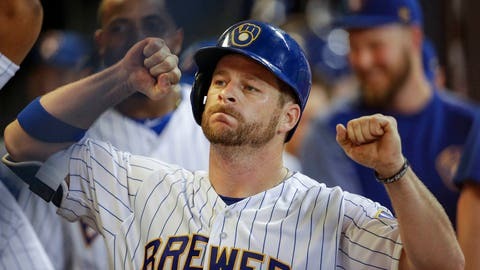 Vogt played 54 games with Oakland and hit just .217, but he topped that with a .254/.281/.508 slash line and eight home runs during his 45-game stint in Milwaukee.